As this year is coming to the end, we all at VIRUSFREE would like to thank to our clients. It’s been a very hard year in fighting the spam and the next one will not be easier. We appreciate the trust you gave us and work hard to not to fail. Thank you for being with us and we wish you all the best in 2019! > Superdrug: “'Tis not the season to be sniffly!” Get your health and beauty app now, as a bonus, you’ll get a nice malware package. > El Gordo Media: “25 FREE SPINS ON ACCOUNT REGISTRATION!” Forget X-mas, let’s use all your money for gambling. > Nicole: “Ohh, are you an ancient god?...” Watch her private photos and then you’ll get extortion email. 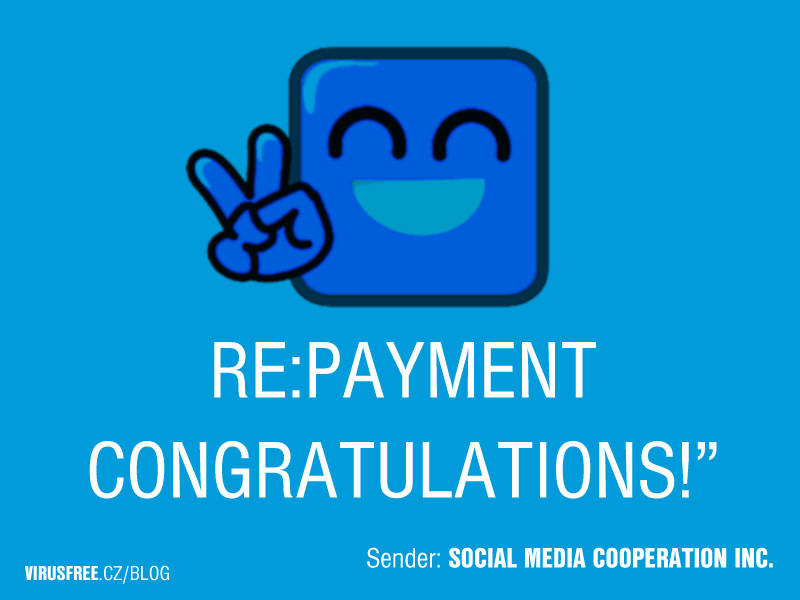 > SOCIAL MEDIA COOPERATION INC: “RE:PAYMENT CONGRATULATIONS!” Congratulations, you won $8,333,000.00 USD, but first send us your payment. As you can see, it’s full of interesting offers, isn’t it? Of course, there’s much more. Seasonal spam aims on the fact that the recipient might need some money, health isn’t that good now (it’s winter, right? ), looks for last minute discounts to get something valuable for his/her friend. Don’t get scammed. There are no such things as a free lunch. You can still enroll our free trial and find out, how’s life without all these above mentioned scam offers. The volume of spam does not decrease, it gets much more sophisticated, delivers malware every second. At VIRUSFREE, we are prepared for this. Join our customer family and enjoy your Christmas time virus-free. Literally. PSST: We’ve got one special X-mas gift here: Order VIRUSFREE for one year now and get one tailored user awareness test in 2019 for free. Hmmm…. what? Yes, get phished from professionals. This offer is valid until the end of the year 2018.